Children typically experience 5-10 colds each year. To try and alleviate symptoms, many parents use over-the-counter (OTC) cough and cold medicines for young children that have not been proven to be effective and can cause serious side effects, especially in young children. In 2008, the U.S. Food and Drug Administration (FDA) issued an advisory that these medicines can be hazardous for young children. Manufacturers of OTC cough and cold medicines responded by changing information on the product labels, to make clear that cough and cold medicines should not be given to infants and children under age four. In January 2013, the C.S. 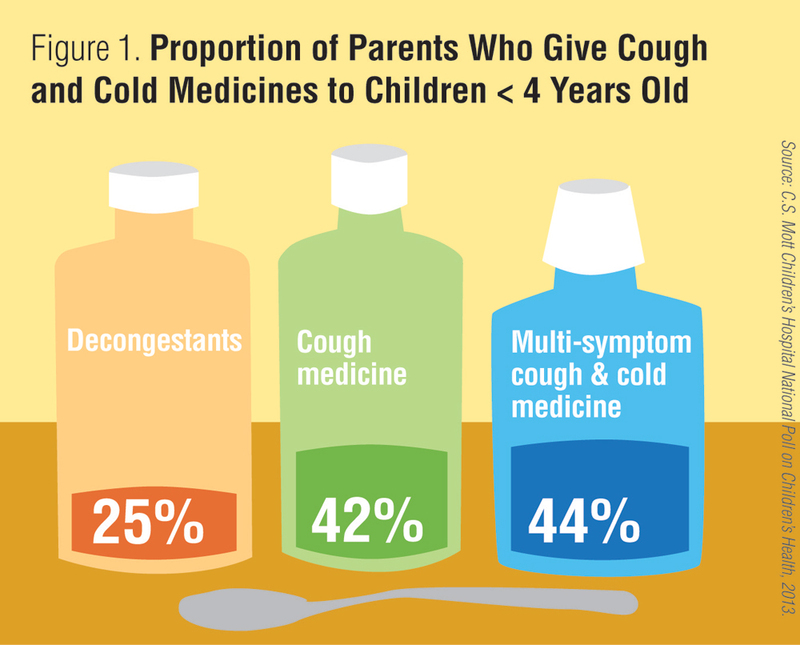 Mott Children’s Hospital National Poll on Children’s Health asked a national sample of parents of children age 0-3 years about their use of cough and cold medicines. Parents of children 0-3 years old were asked about the types of medicine they gave their children the last time they had a cold. Four in ten parents reported giving their children cough medicine or multi-symptom cough and cold medicine. One in four parents indicated they gave their children decongestants the last time their children had a cold (Figure 1). Parents’ use of cough and cold medicines for children under age four did not differ by parent gender, race/ethnicity or by household income. Over-the-counter cough and cold medicines have warning labels that say these products should not be given to children under four years old. 4 in 10 parents reported giving cough medicine or multi-symptom cough and cold medicine to their children under four years old. 1 in 4 parents reported giving decongestants to their children under four years old. In October 2008, the FDA issued an advisory that OTC cough and cold medicines never be used in infants and children under age 2 years. OTC cough and cold medicines have not been proven effective in young children. These products do not reduce the time the infection will last and misuse of these medicines may lead to serious harm. In addition, side effects from misuse of cough and cold medicines in children may include allergic reactions, increased or uneven heart rate, drowsiness or sleeplessness, slow and shallow breathing, confusion or hallucinations, convulsions, nausea and constipation. Manufacturers of OTC medicines responded by changing labeling on their products, to specify that cough and cold medicines should not be used in children younger than four years old. The findings of this Poll indicate that many parents of young children may be unaware of this labeling. It is important for parents and caregivers to read and follow the instructions on medicine labels. If parents have concerns about whether a child has a common cold or something more serious, they should consult the child’s healthcare provider. This report presents findings from a nationally representative household survey conducted exclusively by GfK Custom Research, LLC (GfK), for C.S. Mott Children’s Hospital via a method used in many published studies. The survey was administered in January 2013 to a randomly selected, stratified group of parents with a child age 0-3 (n=498) from GfK’s web-enabled KnowledgePanel® that closely resembles the U.S. population The sample was subsequently weighted to reflect population figures from the Census Bureau. The survey completion rate was 57% among the panel members contacted to participate. The margin of error is ± 8 to 11 percentage points and higher among subgroups. Davis MM, Kauffman AD, Singer DC, Gebremariam A, Clark SJ. Parents ignore warning labels, give cough and cold meds to young kids. C.S. Mott Children's Hospital National Poll on Children's Health, University of Michigan. Vol 18, Issue 2, April 2013. Available at: http://mottpoll.org/reports-surveys/parents-ignore-warning-labels-give-cough-cold-meds-young-kids.